A wild, bullet-riddled night ended this morning with the death of a campus police officer and one of the suspects in the Boston Marathon bombing; the other bombing suspect was at large as of 8:30 a.m., the New York Times reported this morning. One of the suspects and an M.I.T. police officer were killed in the shootout. Police said the suspects are brothers. 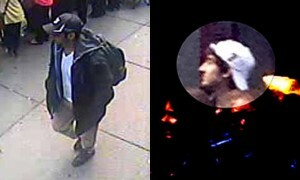 The surviving one was identified as Dzhokhar A. Tsarnaev, 19, of Cambridge, Mass., the Time reported. The killed suspect was identified as Tamerlan Tsarnaev, 26. Investigators believe the brothers are Chechens. Posted: 4/19/13 at 9:00 AM under News Story.